Have you ever heard of a drive-thru garage? Do you know what makes them so special? 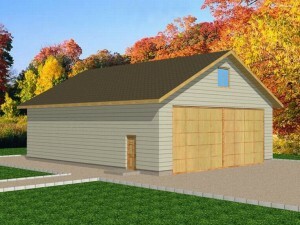 Drive-thru garage plans are just like any other detached garage offering parking and/or storage space. They are available in a variety of sizes and architectural styles. Some come with lofts, storage spaces and other thoughtful extras. But the thing that makes drive-thru garage plans so special is that you can truly drive right thru them. These practical and convenient garage floor plans are outfitted with at least one drive-thru bay. This means at least one bay offers a front and rear overhead garage door. With this special arrangement, you no longer have to hassle with backing in and out of the garage, you can simply pull right thru if you choose. Furthermore, if you are one who likes to store other items in the garage like the riding mower or the kids’ bikes, you can access these things from the rear garage door without ever moving the cars to get to them. Another special use for a drive-thru garage plan comes with those having extra deep bays designed to accommodate boats and trailers. With a drive-thru boat storage garage, you can simply pull into your garage, pull the truck thru the bay and unhitch the boat trailer, leaving it inside. Then, just drive away and close both the front and rear overhead doors safely storing your boat inside. You’ll never have to back the boat trailer in or out of the garage again. Likewise drive-thru RV garage plans are especially convenient for motor homes and campers. It is already hard enough to drive an oversized vehicle much less try to back it in or out of a garage. The convenience of a drive-thru RV bay eliminates the need to back something so monstrous out of the garage. For families that have small children and store toys inside the garage, drive-thru garage plans lend a little extra safety. Open the rear garage door and let the kids access their toys and sporting equipment from the backyard. This will eliminate the need for the kids to be in the front yard or on the driveway keeping them a safe distance from the street and out of harm’s way. Drive-thru garage plans come in a broad range of designs ranging from a 2-car garage to a drive-thru RV garage. Check out The Garage Plan Shop’s collection of garage floor plans today!